8 ounce split parfait with added coconut oil. 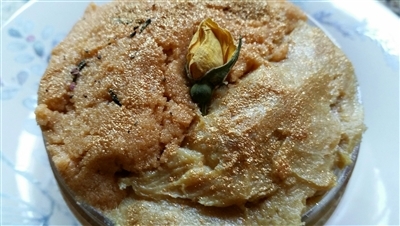 On one side sugar scrub smelling of gingerbread cookies and blended with ground tea leaves next to a side of whipped soap scented with rich chestnut velvet cake. Butylcarbamate, Tetrasodium EDTA, Mica, Fragrance, Tea Leaves, and Rose Buds.